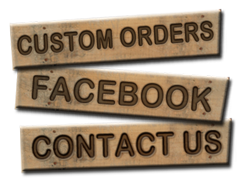 Larry's Woodworkin' is owned and operated by Larry a USMC Veteran. The company was founded in 2011, working out of the garage offering a limited number of items to friends and family. Larry retired from the United States Marine Corps in 2013 after 21 years of faithful service, and decided to take this company to the next level. Now Larry’s Woodworkin’ is one of the leading suppliers of handmade military gifts in the area and the company continues to grow. We pride ourselves in offering quality items at reasonable prices. Located in Richlands, NC we are just a short drive from Jacksonville, Marine Corps Base Camp Lejeune, MCAS New River, Hubert, Swansboro and Sneads Ferry. We also ship our products in the US. All Content Copyright © 2012 Larry's Woodworkin' - Larry Owens. All Rights Reserved. Lejeune Marine Corps Base, Marine Corps Air Station New River and surrounding areas. Shipping is available.